'Desired State Configuration (DSC) is an essential part of the configuration, management and maintenance of Windows-based servers. It allows a PowerShell script to specify the configuration of the machine using a declarative model in a simple standard way that is easy to maintain and understand. Nicolas introduces the basic DSC concepts and provides a simple example of using the 'Push' model of DSC. I, like most other system administrators, want to be able to completely automate the configuration of a server. It means that you can copy files, deploy registry key, software, remove a Windows Feature, etc… It is not just to simplify the task of maintaining it, but also to control the configuration to the extent that I can be confident that it hasn’t been changed. 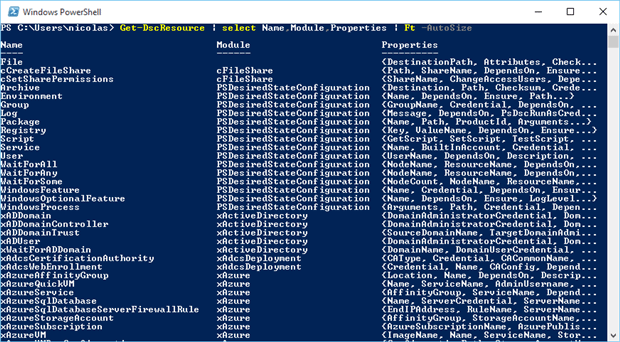 PowerShell 4 upwards provides the functionality to do this, with a feature known as ‘Desired State Configuration’ (DSC). DSC gives us a declarative model for system configuration management. What that really means is that we can specify how we want a workstation or server (a ‘node’) to be configured and we leave it to PowerShell and the Windows Workflow engine to make it happen on those target ‘nodes’. We don’t have to specify how we want it to happen. In my articles, I often use the term ‘machine’ as if it were equivalent to a ‘server’. In this article, however, it is important to emphasise that DSC may be used on several servers but also on workstations. I like to use Group Policy Object (GPO) coupled to System Center Configuration Manager (SCCM) as my day-to-day method of installing and updating software but as time goes on, I can’t help but notice that these tools are becoming duplications in the management of the devices. Push mode: the configurations are sent (“pushed”) manually towards one or more units that we call “node”. This action is done by an administrator. 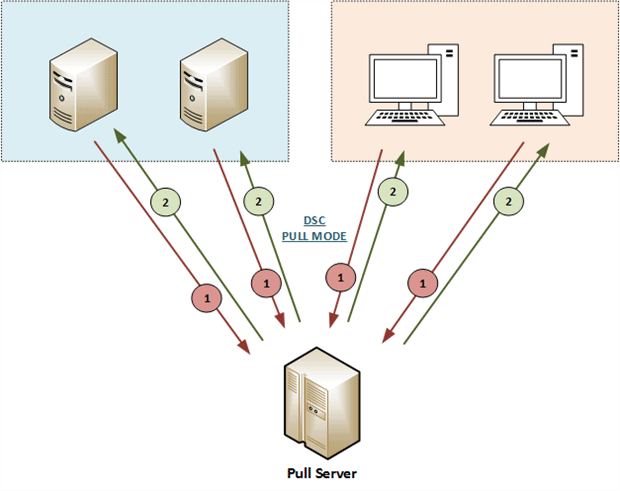 Pull mode: a “pull server” is created and the nodes contact this server at regular intervals so as to obtain their configuration. In this design, only one-way communication is possible. It is the administrator that sends the configuration to the machines. Set up costs. It is not necessary to invest in a new server because the configurations are pushed from your workstation. The simplicity of the architecture because all configurations are stocked on your workstation. The complexity required to manage the machines connected. Because laptops are not always connected to the network, the sending of the configuration may fail. In this architecture, it is the nodes that poll the “pull server” to ask whether a configuration is available (Arrow nÂ°1). If so, then the “pull server” sends this configuration to the compatible machines (Arrow nÂ°2); By default, this interval of communication is set at fifteen minutes. The management of numerous machines, connected or not. As soon as the machine is connected to the network, it asks to the “Pull Server” for its configuration. Note: You will notice that, in these two architectures, we push configurations onto the machines. By default, DSC is not used to deploy users’ configurations. Environment: Manages system environment variables. WaitForAll / WaitForAny / WaitForSome: Available with PowerShell WMF 5 Production Preview. Cross-computer synchronisation allows us to use the dependency between machines during the deployment of their configuration. When there is a change in the status of a resource, another machine may be able to execute its configuration. To simplify the notion of a DSC ‘resource’, you can compare it to a PowerShell module. 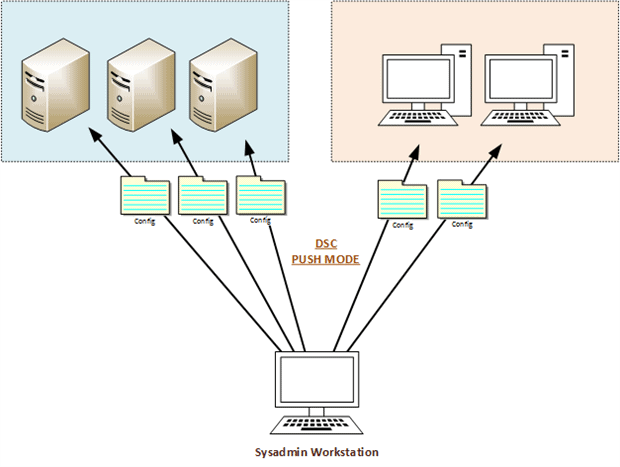 It is important to note that the resources used in a configuration must be present on the nodes as well as on your workstation if you are using push mode, or they should be on the “Pull Server”. As you can imagine, it is now possible to create one’s own DSC resources by defining what you want to configure on the nodes. We shall see this in detail later. Part 1: the key word “Configuration” is followed by the name of the configuration. You are free to write what you wish. Part 4: It is the resource that you want to configure. Here, I point to the resource “File” and “WindowsFeature” followed by a friendly name. My configuration is called DeployHostFile and it contains three mandatory parameters ($Servers, $SourceFile, $DestinationFile). The section “Node” indicates that it deploys a resource ‘File’ type on several machines. But how can we find out the properties of a DSC resource? The Get- DSCResource cmdlet followed by the – syntax parameter displays the syntax and the properties accepted by that resource. Here I want to deploy this file: "\\Share\Hosts" on two machines "ADM01","ADM11" in the following folder "C:\Windows\System32\drivers\etc\"
Second comment: Files with the extension .MOF have been created for each node listed in my configuration. A DSC configuration is based on one or more “MOF” files (Managed Object Format – more information at this address: https://msdn.microsoft.com/en-us/library/aa823192(v=vs.85).aspx). When a configuration is executed it will create a MOF file by node. Here I obtain two .MOF files in the directory defined with the help of parameter -OutputPath "C:\DeployHostFile\". These files are then used to describe how a machine must be configured. 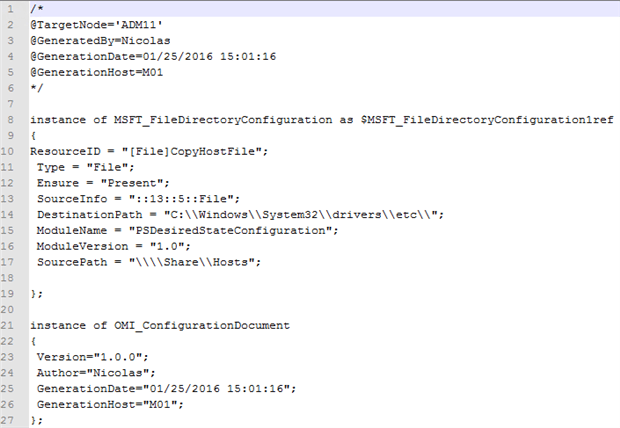 The MOF file contains the DSC configuration directives. MOF Files are generally used to manage systems that use Windows Management Instrumentation (WMI) or Common Information Model (CIM). MOF files are a good way to manipulate WMI settings because MOF files contains WMI classes. MOF files are then compiled using “mofcomp.exe” into the WMI repository. We have just done our first configuration via DSC. The -Wait parameter tells that you want to run the command interactively. Now if I connect on one of my nodes, I notice that the file has been copied. If I delete this file and rerun the previous command, the file will again be deployed. In the above diagram, the actions happen solely on my workstation. I generate the two .mof files locally by executing the DeployHostFile function. The second diagram describes the deployment of the configuration contained in the .mof files on my two nodes with the Start- DSCConfiguration cmdlet. To end this article, it is important to explain one last fundamental concept of DSC: the ‘Local Configuration Manager’ or LCM is the execution engine of DSC. It works on each node and it is this that will apply the configurations. 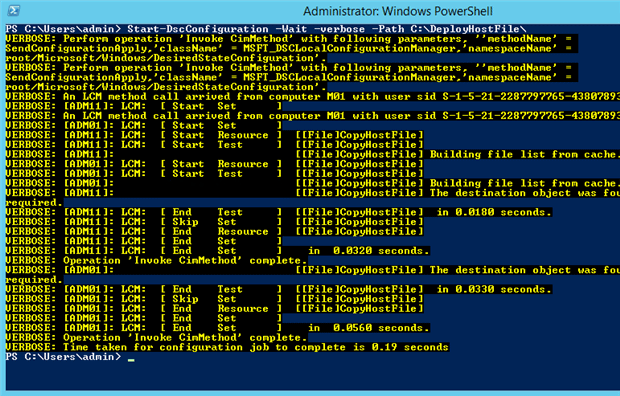 When sending a configuration to a node, LCM will analyse the .mof file. After reading the file, it calls all DSC resources that are present on the node so as to configure the machine as requested. Finally, its role is to control configuration-drift on the machine. AllowModuleOverwrite: This property allows the modules present on the machine to be overwritten when you download a new module from internet. ApplyAndMonitor: The configuration is applied and checked periodically. If a change is noticed, then an entry is created in the event log. ApplyAndAutocorrect: The configuration is applied and the LCM verifies periodically that there is no variation. If a change is noticed, then the configuration is reapplied. ConfigurationModeFrequencyMins: the LCM verifies every thirty minutes (by default) that there is no configuration drift. 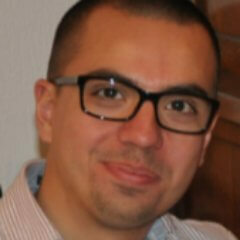 RebootNodeIfNeeded: Indicates whether the node can be restarted automatically. Certain actions need a reboot of the node when the configuration is applied. RefreshFrequencyMins: This property Indicates the frequency (by default fifteen minutes) to which the LCM tries to obtain its configuration from the Pull Server. Push: the configuration is pushed on the node manually. Pull: the node regularly verifies from the “Pull Server” if there has been an update of its configuration. If ‘yes’, then the configuration is downloaded and then applied. I hope that this article has helped you to increase your knowledge about DSC. We have mainly studied the “Push mode” because this mode provides a simple and rapid way of using DSC. But we shall see in a subsequent article that the more suitable mode in a production environment is the “Pull mode”. Before one can get into practical details, there are many DSC ideas and terms to become familiar with. and that is why this article is divided into several sections so as to explain DSC and illustrate all its power. You will soon notice that DSC is a wonderful tool for administrators because it allows great flexibility of use and will simplify your regular tasks. Furthermore, everyone who has a minimum knowledge on PowerShell will quickly be able to use DSC. All these examples are intended to provide a basis that you can adapt to your environment in order to let you explore DSC in more details. Excellent article. Thanks for the great info! Before anyone jumps too far in, this is for an older version of powershell and Powershell DSC, so read the comments on page 4 before reading this. I have registry that was added using DSC to one of my server and I accidentally deleted it/or it is removed for unknown reason. What would happen here? do we have to push the configuration again or due to local settings of the Powershell it repairs automatically with out our push? I guess it depends on the RefreshFrequencyMins under get-DSClocalconfigurationmanager that means we do not need to push the configuration but LCM would verify against the .mof and Auto correct itself if it drifted by any reasons. Great post. One thing I didn’t get the first second was that you have to save the Configuration as a .ps1 file and then execute it from a PowerShell prompt. Then it is possible to execute the function and create the .mof files. I guess ultimate idea is to generate the .mof file for the PUSH method so that we can start-dscconfiguration hence creating PS1 or running through ISE doesnt matter untill u have the .mof file for Start-DSCConfiguration. DSC is a platform you can also create MOF file via different method and modify to get the benefit of DSC. What is a root cause of this error? Is the LCM as WMI Provider, in a similar or same was as other providers for WMI for example there is a built in Registry WMI provider which can be used to read and set values within the Windows registgry. It occures to me the LCM may be a WMI provicer in the same/similar fasion to the build in WMI regiostry provider, is that the case? This is one of the best articles i’ve read on DSC on the internet. The diagrams you created do a fantastic job of illustrating the points you make in the piece. Also, the content included was right on the money and has really helped me get my head around DSC. Keep up the great work!